Thanks to the generosity of travelers on a recent trip to Guatemala with Corazon Scarves, 21 Doley books were donated to children and community centers in Guatemala. Thank you for making room in your suitcases for Doley! Corazon Scarves is a non-profit organization whose mission is empowering women to live lives free of violence and oppression. In 2002, Corazon Scarves founder, Deborah DuPey devoted her life to helping women in developing countries who suffer from violence and oppression. Deborah had made several trips to Central America with Women Walking Together, a group offering domestic violence advocacy training to women. It was on one of these trips that Deborah met the incredible women of Corazon de Mujer (Heart of Woman). The “Corazon Women” are survivors of Guatemala’s 36-year violent civil war. They fled the Guatemalan highlands during the war and created a weaving cooperative to support each other emotionally and financially. 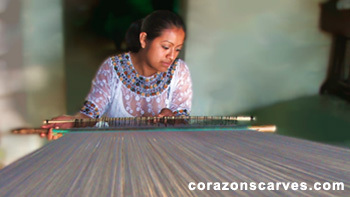 Deborah spent a summer interviewing the Corazon Women, intending to explore the idea of symbolism and scarves through their stories. Deborah soon realized that while symbolism is beautiful, it doesn’t put food on the table or pay for children’s school fees. She was inspired to do something more. Deborah created the Corazon Boutique: an online boutique showcasing the work of women artisans around the world. Corazon Boutique recognizes that when women in developing countries have access to education and financial stability, their lives, families, and communities are greatly improved in a multitude of ways. Every scarf purchased at Corazon Boutique is a day’s income for a woman in a developing country. Shopping at Corazon Boutique helps consumers Look Beautiful and Do Good.